MVPCS teacher Jane Paquet’s class learns about Martha’s Vineyard’s aquatic environments during project period. For the Martha’s Vineyard Public Charter School students in grades 5 through 8, the final two weeks of school are not spent in the classroom following the traditional model of final exams. Instead, students engage in a two-week-long intensive course of their choosing, known as project period. Students took to the course content with vigor. 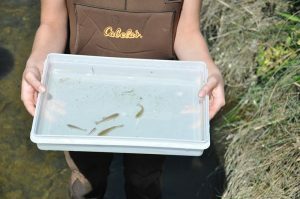 When I visited the class one day at the herring run parallel to Left Fork in Katama, I found Ms. Paquet and her class dressed in waders, studying a variety of fish species they’d caught in the stream. 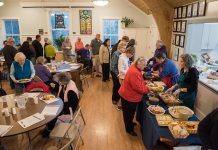 Ms. Paquet explained, “They think everything is a minnow, but we’ve actually caught at least five different species,” before listing their scientific names from memory, along with the species of plants she planned to introduce to the class as the group waded westward to Right Fork. What they didn’t find at the herring run, however, were herring. Ms. Paquet noted that in past years she had at the very least found herring scales on the banks of the stream, which she described as beautiful, “like jewels on the banks.” While mentioning that she is not a herring expert, she had expected to find at least a trace of the once plentiful fish. The lack of herring, if nothing else, provided the students with an example of how habitats change over time, and made space for class speculation and discussion. This year, project period was shorter than usual; however, this did not deter students nor faculty from embarking on ambitious projects. 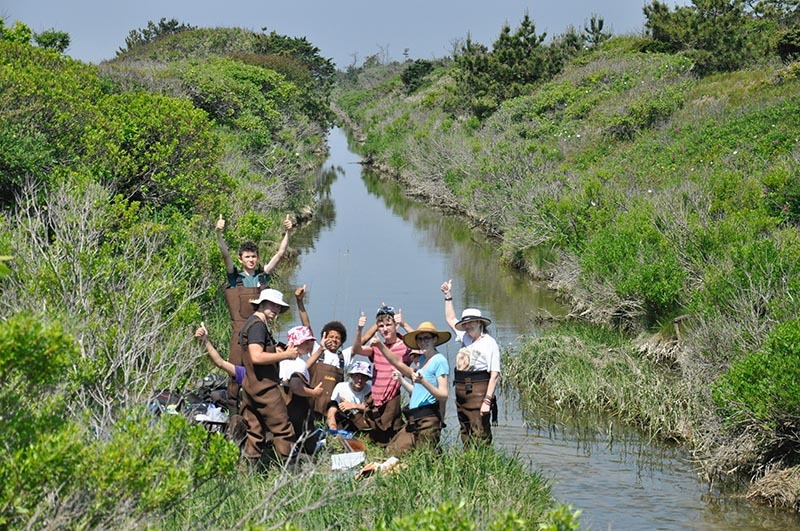 Ms. Paquet’s class visited at least one aquatic location each day, including Turtle Pond in Menemsha, Occooch Pond in Aquinnah, a herring run and Crackatuxet Cove in Katama, the Mill Pond in West Tisbury, and Ponkapoag Bog, just south of Boston. At each of the locations the class visited, students paired up, with the mission of testing water quality and finding and identifying five species of plants and five aquatic animals. Ms. Paquet was especially thrilled at the opportunity to share the bog with her students, and everyone was quick to describe the bog as one of the most exciting parts of the week. Eighth grader Brayden Sayles remembered the way it felt when he submerged his arm into the peat. He said that when he jumped on the surface, the entire bog reverberated around him, which caused everything to wobble slightly, including his classmates and the white cedar trees growing in the dense bog. Sayles’ classmate Jonathan Chivers was similarly intrigued by the bog, which he said was kind of like jelly to walk on. Seventh grader Emmanuelle “Ubie” Woodford spent the last few days of project period researching the West Tisbury Mill Pond. She was soon deep in the mire of debate regarding the fate of the infilling waterbody. While some want to dredge it, she explained, others think that the dam should be removed and it should be restored to a river. In her personal opinion, Ms. Woodford said, she would like to see the pond dredged, because she likes it as it is. One of the most exciting parts of project period — aside from the field trips — is walking around the school and looking at the hard work that all of your peers have done during the weeks leading up to the final day. In Jane’s room, I found students seated at tables arranged in a semicircle, each with a poster, and many with a live specimen such as a tadpole, or a rare northeastern pitcher plant, from the field to show their peers. All of the students had drawn their topics from a hat earlier in the project, and proved impressively knowledgable on their subjects.